Thought provoking and heart examining revelations of God’s Word that will challenge you to experience the depths of the wisdom, knowledge and love of God. You might want to print this out to write down your answers. The very act of writing it down will help you see more clearly those things in your life that need addressing. “Buried beneath the soil within the walks of the sacred grounds of cemeteries are dreams that never came to pass, songs that were never sung, books that were never written, paintings that never filled a canvas, ideas that were never shared, visions that never became reality, inventions that were never designed, plans that never went beyond the drawing board of the mind and purposes that were never fulfilled. Our graveyards are filled with potential that remained potential.”– Dr. Myles Munroe How does it make you feel to read this paragraph? What thoughts came to your mind concerning your own life? Was there something that came to mind that you KNOW you must do before you go to the grave? Ephesians 3:20, “Now to him who is able to do immeasurably more than all we ask or imagine, according to his power that is at work within us.” To the measure we allow Him to work in us, is the measure that He is able to do for us and thru us.- How much are you allowing God to work in you? What are the obstacles you have to letting God work in you? What are the obstacles you have to letting God work thru you? Do you show people who you really are? Or do you tend to hold back? If you hold back showing who you really are, why? Are you telling yourself there are things that you can’t do, or can never do? If yes, where did that come from? Discovering your passion: What is it that makes you come alive? What truly lights the fire within your soul? What could you stay up and talk about all night long? What is it, that when you do it, energizes you? After answering the questions above, what are you passionate about? Based on your passion, can you define your purpose? 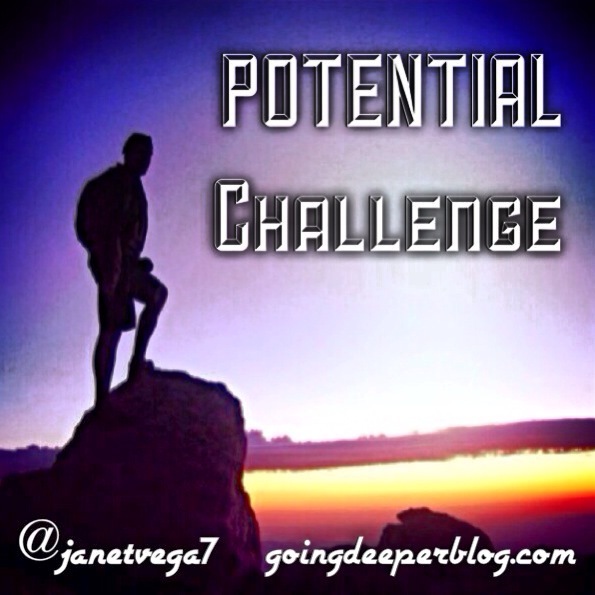 Potential stays potential until we begin to put one foot in front of the other towards our purpose. Name 3 things you must start doing (if you aren’t already) to move towards your purpose. Discipline is a major key to be able to accomplish great things. Your destiny is hidden in your daily routine. Name the things you MUST you do DAILY. Are you willing to work at being disciplined in these areas? Name everything thing that distracts you and breaks your focus. Are you willing to try new things? Categories: Bearing Fruit, Challenge, Faith | Tags: Bearing Fruit, Challenge, Faith, potential | Permalink.